How Do I Wash Machine Washable Hand Knits? Lots of different yarns, from cotton to superwash wool, say that they're machine washable and, often, machine dryable as well. But that doesn't mean you can treat items knit from those yarns in the same way you do the rest of your laundry. Should you trust a yarn that says its machine washable? Probably, but you still need to handle it with care. More and more of today's knitters are looking for yarns that are easy to care for. There are a lot of good reasons to choose machine washable yarn—whether because you're knitting for a baby whose mother won't have time to hand wash a garment or because you really want to get your knit socks clean—but just choosing a yarn that says machine wash and dry on the label isn't the end of the story. How exactly you go about machine washing knits will depend to some extent on the fiber involved. Cotton can generally take a little more punishment than washable wool, for instance, and linen actually gets softer when washed in the washing machine. 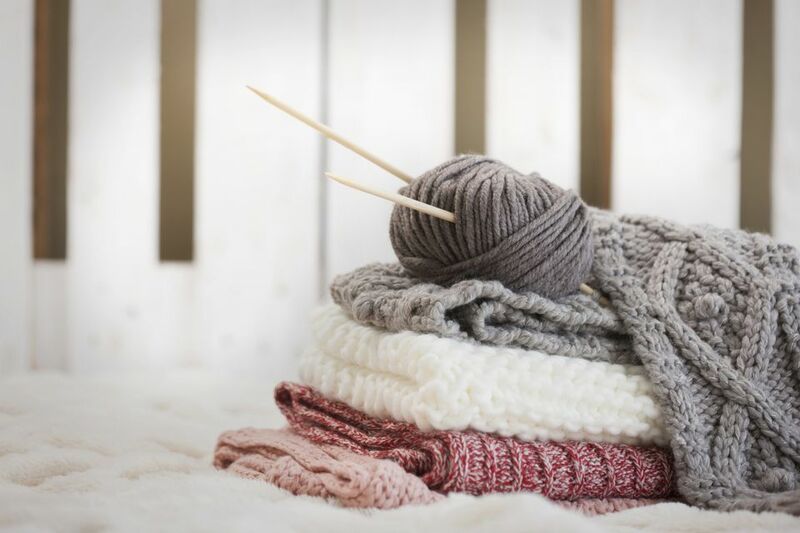 In general, however, the gentler you can be the better off you'll be because your knit items will last longer if they're handled with care. In the case of machine washing knits that means cool water and minimal agitation. For the most delicate fibers and projects (lace, for example), the hand wash cycle on your washing machine may be the best choice, but for sturdier garments and fibers the regular machine wash cycle will probably be OK. It's a good idea as well to use a detergent made for hand knits, usually referred to as wool wash even though it can be used on other fibers as well. Check the label for instructions on using the product in the washing machine. When your items are wet, handle them with care. Some fibers (such as cotton) can stretch easily when wet and may not readily go back to their original shape. Always provide lots of support for a knit item when it's wet. Can Knits be Machine Dried? Some yarns that say they are machine washable say they can be dried in the dryer as well (though some call for lying a garment flat to dry). In almost all cases we air dry our handknits just to be extra sure that they won't stretch out, shrink or otherwise get damaged in the dryer. One notable exception is knit washcloths and towels knit out of cotton. We don't mind if these items shrink and it just seems silly to air dry a washcloth. You can certainly use your own judgment when it comes to drying your hand knits in the machine. If you're worried about a yarn's dryability (or washability, for that matter), knit up a swatch, take good measurements, then machine wash and dry and measure again to see if it stretched, shrunk or if anything else unpleasant happened. What About the Machine's Wool Cycle? Some newer washing machines have what is called a wool cycle on them. This is not for washing wool items that aren't meant to be machine washed! Wool and other animal fiber objects can still felt on this cycle (We tried mine out as an experiment, and it felted). The cycle is meant for washable wool items and might be a good choice for other items that are hand knit and need a little extra care. Experiment with a swatch or something that isn't too precious to see how your knits react to the cycle.